Carlos Rivas of the Red Bulls getting off a shot Saturday night. @NewYorkRedBulls. The Red Bulls suffered a tough defeat, 1-0, to Real Salt Lake on Saturday night at Rio Tinto Stadium in the snow. 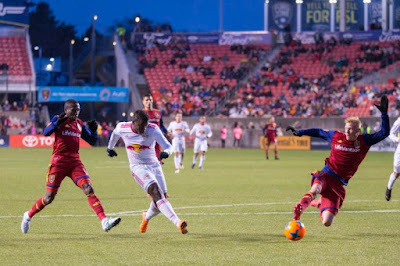 The game was essentially decided just three minutes in when Real Salt Lake was awarded a penalty-kick opportunity, and Albert Rusnak converted for the eventual game winner. This was the Red Bulls' first loss of the 2018 season across all competitions, and they are now 1-1-0 in MLS play. followed by the MLS opener at Red Bull Arena on March 10, a 4-0 win over Portland, and a 3-1 win over Tijuana in the second leg of the quarterfinals this past Tuesday at home. The Red Bulls deployed their sixth different starting XI in this one. Sean Davis and Kemar Lawrence were both left home after taking knocks in training earlier in the week. Red Bulls forward Bradley Wright-Phillips was held without a point as he came on as a sub and his five-match point streak was snapped. The Red Bulls poured in nine shots, with four on target, while Real Salt Lake had six shots, and three on net. Coincidentally, the Red Bulls were unbeaten in those last five matches across all competitions. They held scoreless for the first time this season after multiple goals in the last four games. The Red Bulls are 14-15-9 all-time in the month of March, and have scored 49 goals and allowed 52. The Red Bulls return home for their next MLS match, hosting Minnesota United FC next Saturday, March 24, at 7 p.m. ET. After that, the Red Bulls get a much-needed 11-day break until their Scotiabank CONCACAF Champions League semifinal matchup at Chivas Guadalajara on April 4. They host Chivas in the second leg on April 10 at Red Bull Arena.